I learned a lot from listening to Groundhogs guitarist Tony McPhee, and was thus pretty nervous when I lined up as a teenager to get this album signed by my hero. He's now a chum of mine - how nice it is to buy one's guitar hero a pint while gossiping about respective tour experiences. 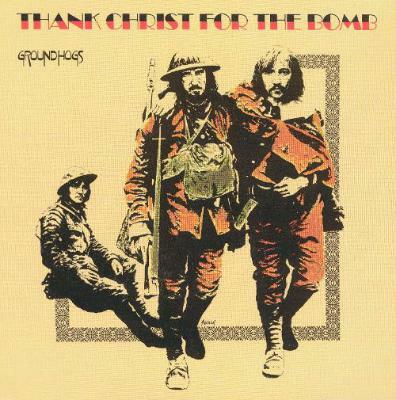 Thank Christ For The Bomb, what an outrageous title for an album, and the songs are full of angst and drama too, not to mention the fabulous interplay between the three band members. I liked the way McPhee invented his own chords using drone strings - I'd studiously watch his fingers when the 'Hogs had a virtual residency on the Sunday rock shows at the Croydon Greyhound. How do you describe The Groundhogs... psychedelic blues, maybe? Regardless of that, Tony McPhee is one of Britain's greatest guitar players - you didn't get that kind of fret dexterity, or in fact reference to nuclear Armageddon of any kind, in Bert Weedon's Play In A Day book, that's for sure!